When you know that Virabhadrasana translates as ‘fierce warrior’, in the incarnation of Shiva, Warrior postures can feel far too masculine, even scary. But if you can find strength with purpose and humility in the Warrior series, then you empower yourself for whatever challenges life presents. So this post is a call to all, especially women, to be brave warriors, to embrace the yang, and thus become the hero in your own life. 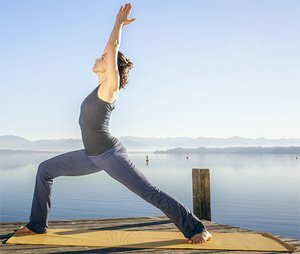 The yoga warrior needs no weapon, other than a determined Drishti gaze over a pointed middle finger on an arm extended strongly forward in Warrior 2 –positive, resolute, courageous. The lunge forward is assertive but not aggressive. Even with the strong forward momentum, you must stay grounded in the present and anchored to the past – a physically expression that we can only move forward in life if we learn its lessons. As you bend your front knee lower in full expression, so testing your sense of stability, you must trust yourself to an uncertain future, as much as you must sink your hips evenly and ground into the outside edge of your back foot. The back arm is extended strongly, fingers pointed, so you never forget where you have come from. It is a tug-of-war between moving forward and being held back and your job, fearless warrior, is to stay present and focused. In Warrior 1, hips motivating forward and arms raised, elbows locked in close by your ears and fingers pointed, you can exalt and celebrate your own strength. Again you are challenged to find steady ground in your past through firmly planting your back foot, as much as you try to angle your hips forward in the lunge like headlights pointing to the future. Strong arms stretch heavenward, even as you must draw down into the earth to maintain your roots and stability. There is a sense of facing your fears to move forward, but you must keep contact with the past and avoid losing your balance in an ego rush to the future. 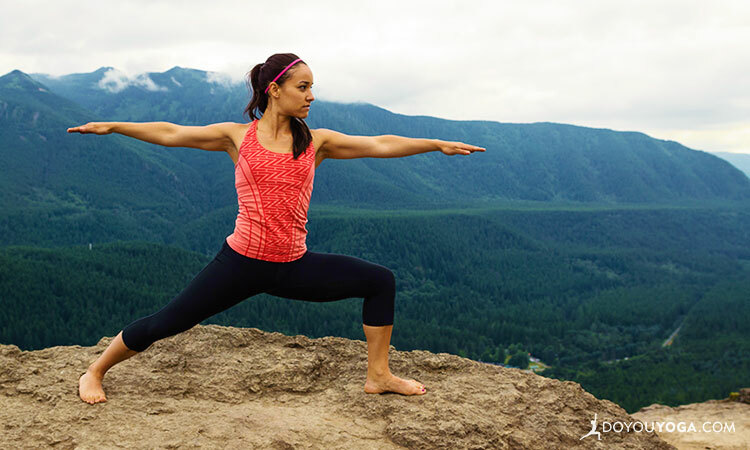 In Warrior 3, we take the strength and focus of the first two warrior positions to find what we truly need—balance. From Warrior 1, you need to focus firmly in front of you, eyes downward to be sure of the ground ahead, trusting your front leg to take your weight as you lift your back leg. Arms can vary from bringing your hands together in prayer at your chest; to extending your arms behind your back with fingers interlaced or arms aerodynamic like wings beside your body; to arms strongly extended forward, ultimately taking a pistol grip with your fingers. Warrior 3 feels like a strong and aggressive thrusting, with the balance of the standing leg keeping you anchored in the present and the extended back leg connecting you to the past. Once again you are reminded that you bring both your strengths (and weaknesses) into the challenges of today, in order to face the future with focus and confidence, whatever battles lie ahead. The sequence can be changed, depending on whether postures are static or flowing and can even be linked as a Warrior ‘dance’. Variations like Exhalted Warrior and postures like Triangle (Trikonasana) can also be added in (It is however common to come into Warrior 3 from Warrior 1). For all the yang energy embodied in the Warrior series, there is yin surrender too—to the past and its limitations and into humble assertiveness...rather than succumbing to arrogant aggression. When the spiritual warrior humbly asserts herself, she (or he) finds the hero within.